The best repertory and art-house screenings, special presentations, lectures, and limited engagements in Toronto. Still from Boy Meets Girl. At rep cinemas this week: a bold debut from French master Leos Carax, a paranoid horror pastiche, and a Coen brothers classic. Friday, August 9, 6:30 p.m. Most of the ingredients for Leos Carax’s charmed career are already there in Boy Meets Girl, a bold debut by most standards, but especially impressive given that he was only 23 when he made it. To start, there’s Denis Lavant, the pug-faced, light-footed star of three of Carax’s four subsequent features, on hand as the recently dumped and perpetually lovelorn Alex, a moody surrogate for his maker. Just as important, there’s the heedless mix of romance, sympathy for outsiders, and compulsive citation of other films that have become Carax’s métier, all which gives the film the texture of an edgy pop song. Though much of Carax’s debut feels fashioned out of Jean-Luc Godard and Carl Theodor Dreyer’s old threads, there’s a spark to the best moments that points to the idiosyncratic brilliance of later films like Mauvais sang. That film’s ecstatic centrepiece finds a heartbroken but giddy Lavant bounding down the street to the sounds of David Bowie’s “Modern Love”—a moment so potent that it was gently recreated with Greta Gerwig in Noah Baumbach’s Frances Ha just this year. Untouchable as that scene may be, Boy Meets Girl has its own showstopper, also scored to Bowie, as Alex wanders alone at night, gawking at a couple as they twirl mid-street, like the figures in a wind-up music box. The lyricism of that set piece is more palatable than Alex’s post-adolescent despair, but the uneven mix of the two is poignant and frequently lovely all the same. 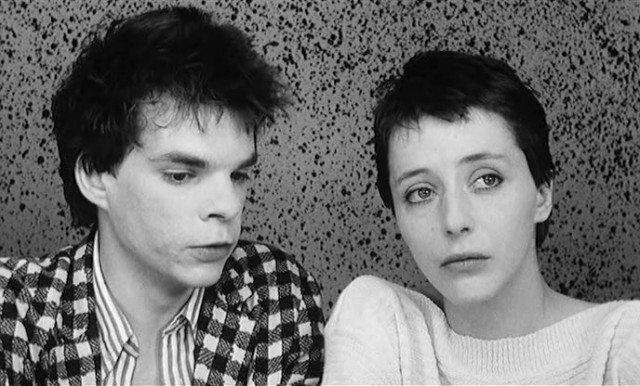 Boy Meets Girl kicks off TIFF Cinematheque’s retrospective, “Modern Love: The Films of Leos Carax.” Carax will be in attendance for a discussion following Saturday and Sunday’s screenings of Mauvais sang, Holy Motors, and The Lovers on the Bridge. For information on other screenings, see TIFF’s website. You never see Toby Jones in the second Harry Potter installment, but one look at the diminutive, put-upon CG house elf Dobby is as good a tipoff to his identity as the sound of his soft, unfailingly polite voice. Jones’s downturned frown and heavy blue eyes make him the perfect anchor for Berberian Sound Studio, a punchy and ingeniously constructed horror pastiche that runs him through the psychological gamut. Jones is wonderful as Gilderoy, a British foley artist flown into Italy to work on a seedy genre movie that’s immodestly titled “The Equestrian Vortex.” It’s perhaps for the best that we don’t get to see a frame, and are left to piece Gilderoy’s work together through the off-colour stage directions given by the crew (e.g. “Flashback to the priest stabbing a witch’s body”) and the eerie sound of smashing melons. What we do see is the already reticent Brit’s gradual retreat into the paranoid spaces of the recording studio and, further to that, his mind. Hemmed in by the tall, bearded alpha males all around him and starving because of an endlessly deferred paycheque—as one critic quipped on Twitter, this is foremost a thriller about the dangers of working freelance—Gilderoy has nowhere to go but further inward, where life starts looking a lot like a horror film. In his portrait of a deranged sound engineer who loses himself in his work, director Peter Strickland clearly has Brian de Palma’s Blow Out on his mind. Strickland gets roughly the same mileage out of the mechanics of the post-production process, fetishizing the analog soundboard knobs and dials that become a second body for Gilderoy. But Berberian Sound Studio works best, and smashingly at that, as a comic tribute to countless half-remembered late-night movies, watched out of sequence and in the dark—the kind you think you’ve dreamt until Google tells you otherwise years later. The Coen brothers might be the most paradoxical auteurs in the American cinema—a filmmaking team that’s more consistent in output than most single directors, whose work is always distinctively theirs despite its frequent origins in other films and novels. Miller’s Crossing is a good case in point. Steeped in gangster and film noir conventions, and indebted to the crime novels of Dashiell Hammett, it’s nevertheless unmistakably the Coens’ film from the first scene, an immaculately composed monologue about character and ethics delivered by Caspar (Jon Polito), a grotesque Italian businessman pleading to an unseen listener for help taking out a shifty associate. Discussions about the nature of crime, punishment, and integrity are a Coen brothers staple, as are caricatures like Caspar, and Miller’s Crossing finds a nice middle ground between those loftier inclinations and baser character satire and slapstick. The film follows the changing fortunes of Tom (Gabriel Byrne), an opaque thug working for political heavyweight Leo (Albert Finney), as he decides whether to grant the irate Italian his wish in offing Bernie (John Turturro at his manic best) or to stay true to his boss and their shared lover, gun moll Verna (Marcia Gay Harden), who happens to be Bernie’s sister. Tom’s crisis of conscience has a tragic weight to it, even if it’s rooted in the Coens’ casual misanthropy. What makes Miller’s Crossing so unique, though, is its preternaturally light—at times surreal—touch amidst its weighty look at salvation and damnation. (Also, its madcap flair in staging intricately choreographed gun battles offhandedly, in the background of dialogue scenes.) You know a Coen brothers movie when you see it, even with material as well-worn as this.